Having climbed above the previous 2007 market peak in September, national residential property values continued their rise in October, and now sit 1.1% above the peak of five years ago, government valuer Quotable Value (QV) says. Jonno Ingerson, QV.co.nz research director, says national values are up 1.9% over the past three months and 5.7% over the last year, with the average current value now NZ$420,048. "As a result, values are now 1.1% above the previous market peak of late 2007," says Ingerson. Last month QV said national property values had "edged ahead" of the 2007 peak for the first time in September, but were still 12% below their 2007 highs when adjusted for inflation. Auckland and Christchurch continue to lead the way. Values in the wider Auckland region have risen 3.3% over the past three months and 9.2% over the last year. Prices in the old Auckland City are up 10.7% over the last year to an average current value of NZ$702,106, and North Shore and Manukau up 8.9% and 8.1% respectively. "Values in the wider Auckland area are now 9.1% above the previous market peak in 2007 (with the average current value at NZ$597,121), led by old Auckland City which is 12.5% above that mark." QV says there's growing demand for more listings throughout Auckland with good properties still attracting numerous interested buyers, with auctions proving successful for many. “Investors are also coming back into the market, most looking to on sell relatively quickly as they try to capitalise on the quick growth in the current market” says QV operations manager Kerry Stewart. Christchurch values are up 5.9% over the last year, and 1.8% over the past three months leaving Christchurch prices 3.8% above the 2007 peak with an average current value of NZ$397,979. Nationally Ingerson touted "a late spring surge in activity" with both buyer enquiry and the number of sales rising. But a lack of listings continues to hold constrain the market, especially in the major cities. “Although the nationwide increase in values is largely being driven by Auckland and Canterbury, there are some signs that other main centres and provincial cities are increasing in value also” says Ingerson. “Property investors and first home buyers remain active in the market, encouraged by low interest rates." In Hamilton QV says values are generally still rising with a 3.1% year-on-year increase, and 0.5% rise over the past three months. Tauranga values have been up and down over the last six months, but year-on-year are 2.2% higher. Wellington values rose for the second straight month and are up 2.4% up over the past year, with the average current value put at NZ$436,460. 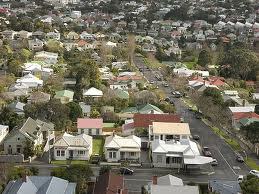 Values in Dunedin are up 4.5% year-on-year, and 1.4% up over the past three months. Meanwhile, QV says values in all the main provincial centres have risen over the last three months, except for Wanganui and Invercargill which are slightly down, and Whangarei which is 1.3% lower. "However, over the past month only Invercargill has continued to drop with the other two areas rebounding slightly." See QV's press release here and its residential price movement data here. Property prices at record highs. Geeze thanks, now I am stucked with that Mahattan Transfer's Twilight Zone tune in my head !! It seems $1m won't even buy you a good house in Onehunga anymore! Architectural design rule: Light from at least two side of every room. $1.3M and an epic fail, none of the bedrooms comply. arrggg.. I should have waited a little longer.. bugger! To be realistic, buyers need at least $1.5 mil to buy a decent 3-beds 2-baths in central suburbs. More if double grammar zoned. It's good to know we are all indebted and yet under employed millionaires - the future looks bright. Ah yes, houses go up. Olly is right once again. Yes great news for the landed gentry - never been better - shame about all the unemployed people.